If I knew the secret of coping with life and its mysterious challenges I would, by now, be a rich or at least, a famous man. It is though a good idea, to share some moments from the lives of others, or myself, that it is possible to put in commonality. When I was an older teen-ager, the one phrase that got me right down was “Jonathan, be yourself”. Now that was just the question I was trying to resolve as I saw friends and companions seemingly sailing through their lives, without the inner storms that were worrying me. I resented that phrase; it added to my discomfort and I resolved never to use it to others. I have myself a simple enough solution, but it entails doing something that is not so easy – to go outside myself, and join in with others, not as an interfering busybody, but rather as a person who waits and responds to the demands of life and builds up a reciprocity with others. My solution will always be linked to my conviction that coping with life is to do with religion. Life and religion are intrinsically bound together whatever other citizens of England may think. When I meet somebody who says to me, “Father, my husband and I are not very religious” as happens from time to time, my instinct is to reply; “I am not very religious either”. It is so clear that for many people religion is in one department, and ordinary life in another. I would like to share a story of James Hayes. He is a person whose extreme difficulties illustrate what I mean. James speaks with quite a strong midland accent; he is nobody’s fool and nobody’s push over. He is 70 years old, a war baby as I am. I have known him for many years. He is a person some might describe as a down and out! He was orphaned at six months when his mother deserted him and was brought up by nuns and others. He has a tendency to mental instability as he himself describes. 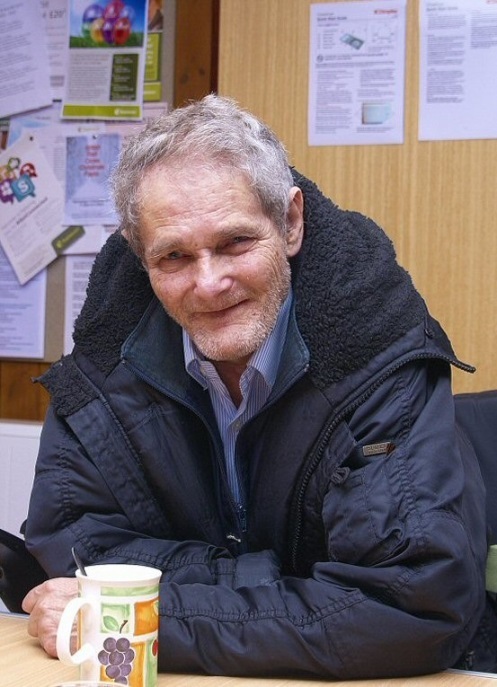 He has lived in many night shelters all over Britain; he has spent time at her majesty’s pleasure; he is a poet and an author and he has written his autobiography called “Strength to Overcome”. He did have the advantage of being brought into contact with our Catholic Church by the sisters, and at the age of nine was altar serving in Church. He describes his first Holy Communion with the simplicity of someone who was enchanted. A very special day that I remember was my first communion. I was eight years old. On that day everyone involved had a special breakfast and then we lined up to have our photographs taken. I remember that I was dressed in my Sunday best and I also wore a sash. In the afternoon we went out and then at teatime we had a special high tea. The whole day was great. James as an altar server was abused sadly by a priest at the age of 9. It was a frightening experience for him. Later on in a psychiatric hospital he was also abused by a male nurse. This was in the 1960’s. The nurse was convicted. Although he told the police about the priest, too, they could not convict him because of lack of evidence, but the orphanage was closed down and James was able to pursue a skill he had acquired that was to be of good use to him all his life. He became a master baker especially for bread rolls. Later on in Newcastle he made great friends with a priest called Fr. Tom Cass who was a legend in his own area for his goodness and kindness. James felt ashamed when he let the priest down over something, but Fr. Tom took him straight back again. James explains in “Strength to Overcome” how he tried to take his own life many times. He used to get utterly depressed. Apart from rare spells in prison, usually for absconding from places of refuge, he also spent a lot of time in hospitals. These appear as moments of respite. In fact, during his last year, 2013 – 2014, he has been extremely ill, and was in and out of hospitals. He had every kind of adventure. I remember him first at the Mariapolis, I took part in, in the 1970’s, in Bangor, North Wales, I think. James was living in East Anglia, at the time, and he set off about three weeks before the Mariapolis began, on foot, to make his way to Bangor. He hitched the odd lift here or there, and arrived to sit quietly in a corner surveying the scene. He loved to meet people where he finds God’s love. When I got to the venue on the Saturday, I found it was in a Methodist church and wondered what I was doing there as it was not my scene, but I stayed for the concert. The church was packed with about eight hundred people and a group called Gen Verde performed the concert. They were a group of people from around the globe that sang, played music and performed sketches and mimes. It was the most enjoyable evening that I had ever had. I was very much aware of unselfish love and peace. What was that? It meant these people were giving without asking anything in return; accepting without judging; supporting without taking over your life. Life and death adventures followed and last year I met James at Cefn Lee, the Mariapolis site in North Wales. He was his usual taciturn self, this year in a wheel chair. Clearly he was ill, and he gave me a poem that he had written. I end with this poem after this brief sketch of James’ life. Hopefully what he has been through will be an encouragement. When he recites any of his poems in his weak midland voice, the Mariapolis always erupts in spontaneous clapping. so this message to my friends I send. I thank you for the kind support you have given me. Thank you for all the support and the love you have given me. you loved me of your own free will, and I know that you love me still. For a new commandment was given to you, “love one another as I love you”. The love God gave you was free. This is why I know you still love me. I did the best that I could do in the allotted time. in the arms of one who loves me, and who knows I did my best. Thank you, Geoff, for your very kind comment – and, YES, some people have an amazing ability to connect with others poetically. Best wishes. Socius.